Is there anything worse than entering a pub with no atmosphere? Leaving you to make some pretty awkward eye contact with the weird old guy in the corner? One pub is sick of this and is wanting to bring an atmosphere each and every evening. Say hello to The Noel’s Arms! Located near to the train station, this Melton Mowbray pub offers its customers great tasting real ales, craft beers, wines and much more! The Noel’s Arms is also a live music venue. You will find some awesome bands playing here most nights which always attract enormous crowds. They have plenty of acoustic singers too, so there’s sure to be something for everyone. You can find details and dates of the various acts appearing on their Facebook page. They have regular bands and acts that play most weeks; however, they are always looking for new bands and musicians. So, if you are good with the spoons, or you can sing like a bird, get in touch. Although The Noel’s Arms doesn’t offer food yet, every Thursday they allow you to bring your own. On ‘Takeaway Thursday’ drinkers can either bring their takeaway in or have it delivered to the door. Pizza and some great music? Count us in. Some exciting plans are afoot at The Noel’s Arms with provisions for a bank holiday beer festival being put into place. The suggestion is for all the public houses in Melton Mowbray to come together, creating one huge pub party for all. With plenty of live music too, obviously. The Noel’s Arms is now serving Two Chimps Coffee – Woohoo! Currently, they are serving ‘Box of Frogs’ from El Salvador and our decaffeinated ‘Starry Eyed’ from Costa Rica, both available through their espresso machine. In the coming months, The Noel’s Arms will be serving coffee and cakes during the day with acts playing too. Think of it as a rock café – now that sounds like fun! The Noel’s Arms also offers takeaway coffee. They are in a great spot for people coming off the train, so if you ever find yourself taking the train to Melton, pop into The Noel’s Arms and grab a coffee for your onward journey. If you don’t drink alcohol, hot drinks are also available in the evenings. This includes our hot chocolate which we teamed up with B Is For Brownie to create. Loved one of our espresso martinis, but haven’t had one since? Well luckily for you, The Noel’s Arms are introducing coffee cocktails to their drinks menu too! When it comes to coffee, fresh is best. We hand roast all our speciality coffees in small batches so when The Noel’s Arms receives their coffee; it is as fresh as possible. 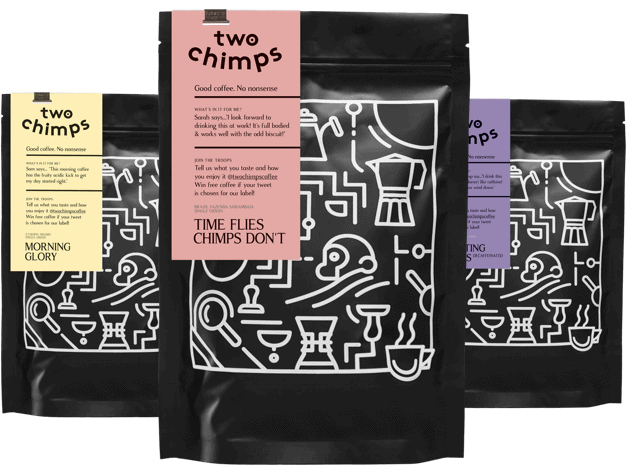 We contact all resellers of Two Chimps Coffee for their coffee order at the start of the week and roast it fresh to order. Looking for some fresh coffee to replace your supermarket stuff? Head over to our shop where you will find a full list of all our coffees. All with free 1st class delivery.